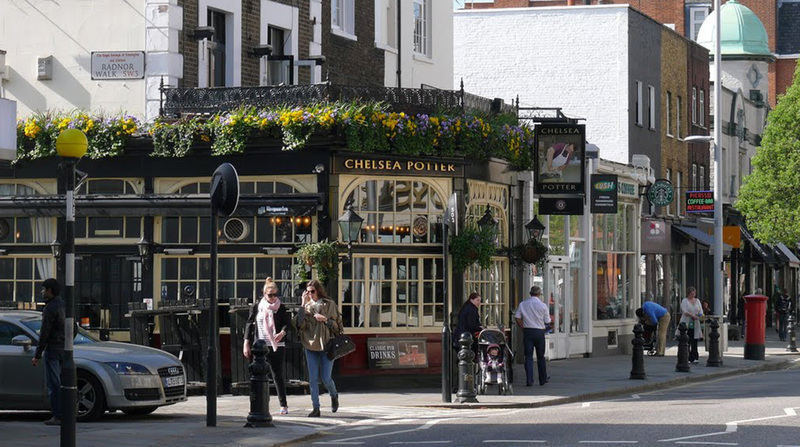 Situated in the heart of the once trendiest street in the world, the Chelsea Potter on the King’s Road is a traditional English pub and boasts a long history that has made it a favourite with the likes of Jimi Hendrix and the Rolling Stones. Calling all fashion aficionados, this stunning London gem is in the heart of the capital’s trendiest street, the Kings Road. The King’s Road was originally Charles II’s private route to travel from London to his palace at Kew. It remained a route reserved for royal use until 1830. Chelsea Potter is excellently suited to its locality, its royalty among London pubs. Was named ‘the Commercial Tavern’ until 1958 when it was renamed in commemoration of a great ceramics artist named William de Morgan who founded the Chelsea Arts Pottery in 1872. Don’t be misled by Chelsea Potter’s blue blood, as it was also a favourite watering hole for the likes of Jimi Hendrix, Mick Jagger and The Rolling Stones in the swinging sixties. As well as a Rock and Roll star studded history we’re proud to say our menu is packed with Great British pub food classics, including iconic dishes like our hand-battered fish and chips, pie and mash and succulent burgers. Our drinks include a great range of real ales and an extensive wine list. Our cask ales range has some of the best in British beers, including the new 1730, our very own special pale ale. The team at the Chelsea Potter look forward to welcoming you soon at this fantastic traditional London pub on the King’s Road.